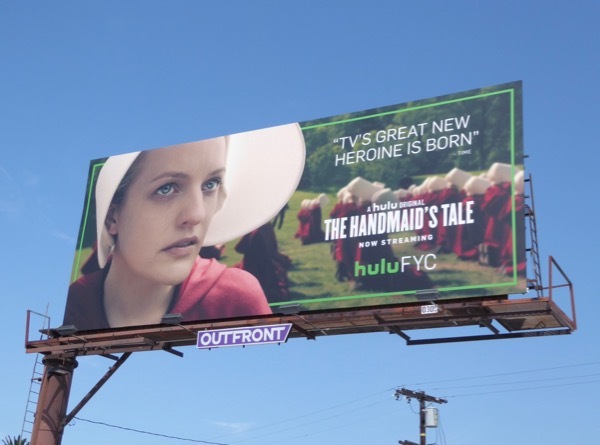 One thing's for sure this Emmy season, streaming subscription service Hulu has high hopes for its new dystopian drama, The Handmaid's Tale. 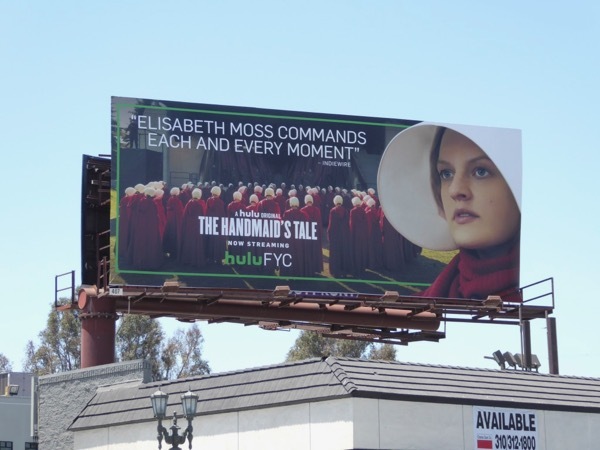 In recent months Hulu has been bolstering its original content, and its new television adaptation of Margaret Atwood's 1985 novel starring Elisabeth Moss couldn't have been more timely with the current political climate America finds itself in, with women denied basic rights and brutally subjugated by the religious male elite and forced to bear children for the ruling class. The first three episodes were available for viewers to binge watch, then you had to wait on a week-by-week basis to see all the ten episodes of the first season (although the series has already been renewed for a second season). 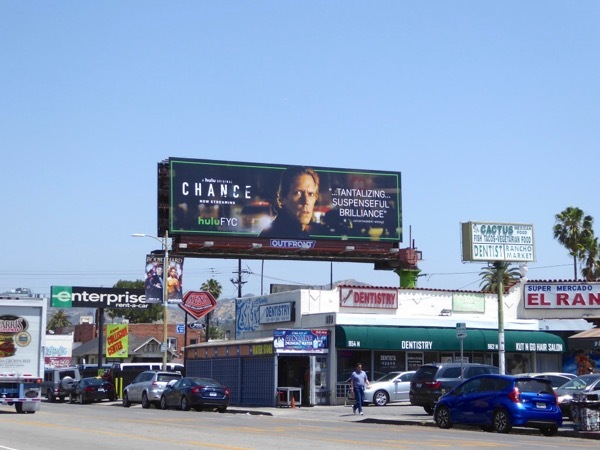 These Emmy consideration billboards for the show were first snapped along Venice Boulevard on May 22, then additional ad creatives were spotted above Hollywood's Cahuenga Boulevard and Sunset Boulevard through June 12, 2017. 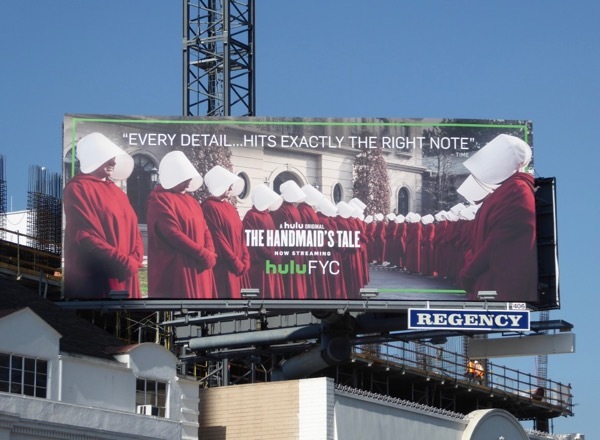 If you like these ad creatives, make sure you also check out these clever teaser and series launch billboards for The Handmaid's Tale. 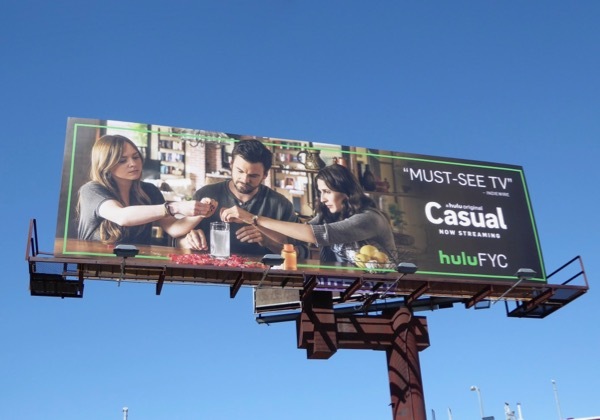 With awards season becoming even more competitive thanks to digital streaming upstarts like Hulu, Amazon and Netflix, Hulu was one of the first this year to fill the skies with its FYC outdoor ad campaign. 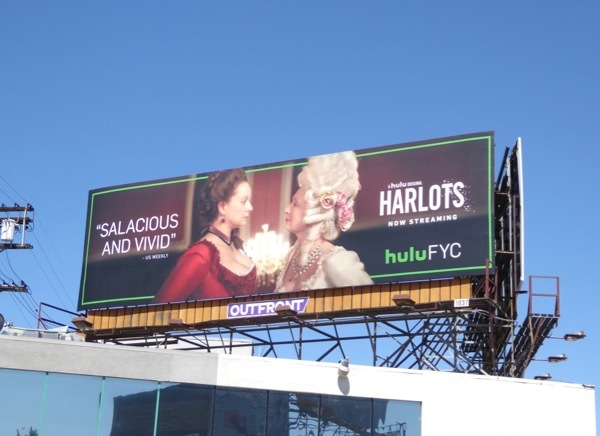 This arresting ad creative for Hulu's British period drama Harlots was snapped above La Cienega Boulevard on May 13, 2017, plus you can also enjoy these Harlots season one billboards from earlier this spring. In the series Samantha Morton stars as a brothel Madam in 1763 London competing with other establishments of the same ilk and not afraid to use her daughters to make a living. 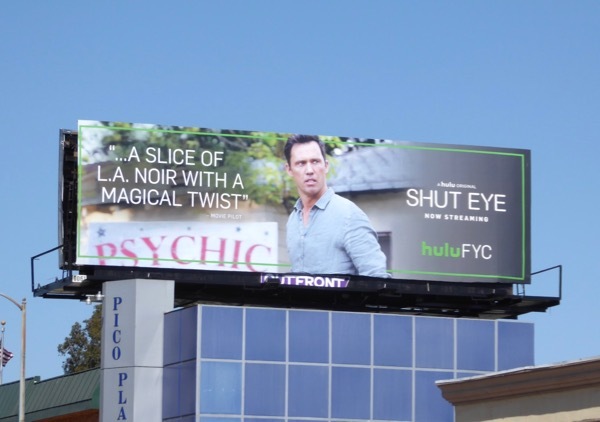 Meanwhile at the end of 2016 Hulu also debuted Shut Eye, a crime drama about L.A.'s fortune-telling establishments with a magical twist, starring Jeffrey Donovan. 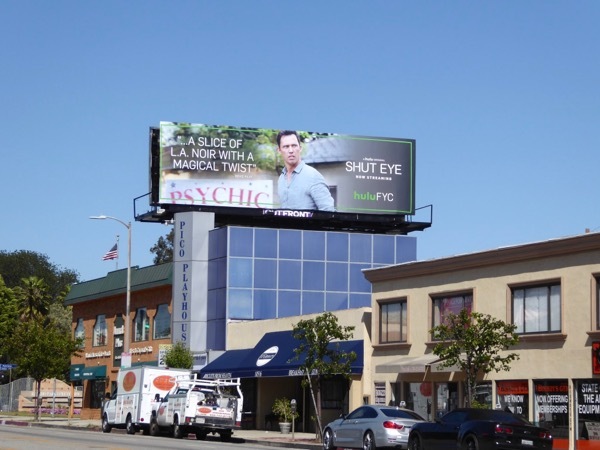 This Emmy consideration billboard for the show's debut season was snapped along Pico Boulevard on May 13, 2017, and if you're fan of the series be sure to also check out these Shut Eye launch billboards. Hulu's quirky family comedy Casual was back for a third series this summer, but it was the sophomore season that is in the running for Emmy consideration. Tommy Dewey, Michaela Watkins and Tara Lynne Barr continue to make the show 'must-see TV'. 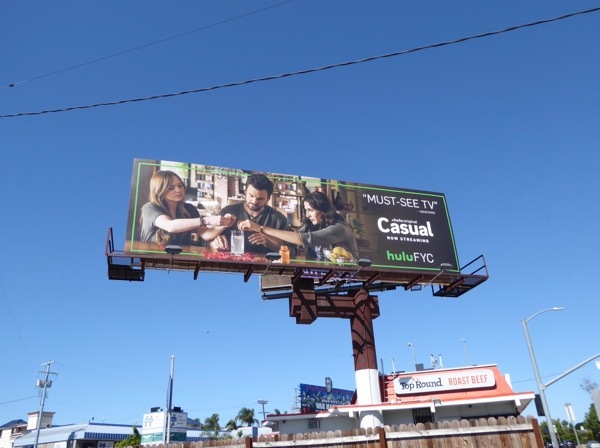 This Hulu FYC billboard was snapped along Olympic Boulevard on May 13, 2017 and if you're fan of the show, be sure to also enjoy these other Casual TV billboards from recent years. 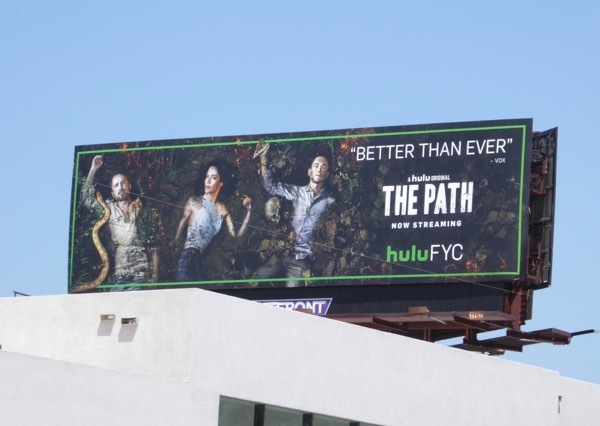 Hulu's religious cult drama The Path, starring Aaron Paul, Michelle Monaghan and Hugh Dancy was back and apparently 'better than ever' with its second season earlier this year. 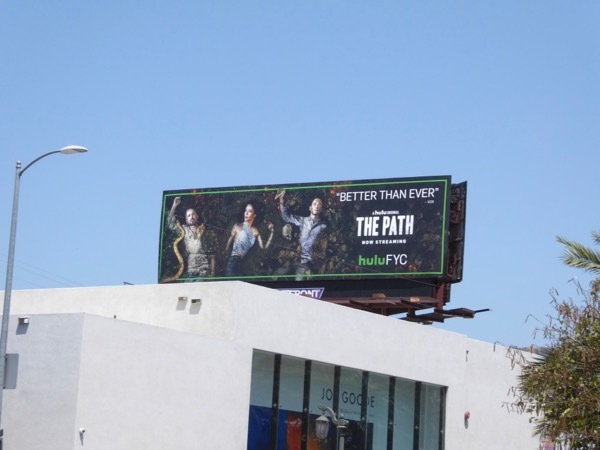 This Emmy consideration billboard, which combines all of the separate season two billboard designs for The Path into one ad creative, was snapped along Highland Avenue on May 11, 2017. 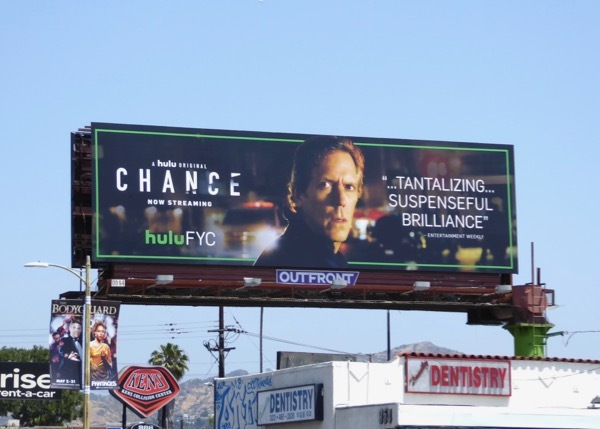 And finally, after receiving critical acclaim for AMC's' The Night Manager mini-series last year, Hugh Laurie was back on the small screen in Hulu's suspenseful original series Chance, playing a neuropsychiatrist. 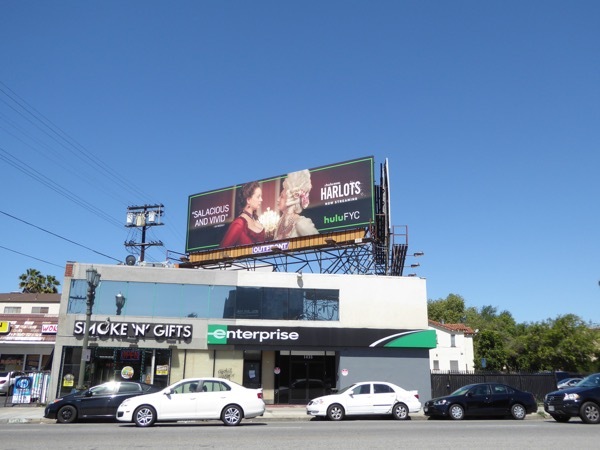 This Emmy FYC billboard was photographed along Hollywood's Vine Street on May 11, 2017 and you can also check out these Chance season one billboards from last October. 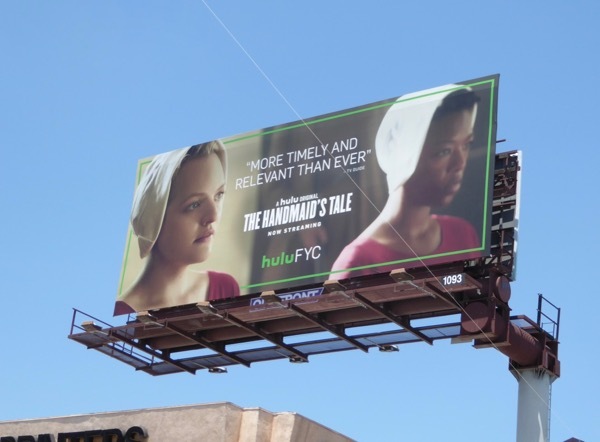 As you can see, Hulu has really upped its game with this year's unified Emmy billboards, but will this cohesive campaign be enough to secure a bevy of Emmy nominations this season? We'll just have to wait until July 13, 2017, to find out. 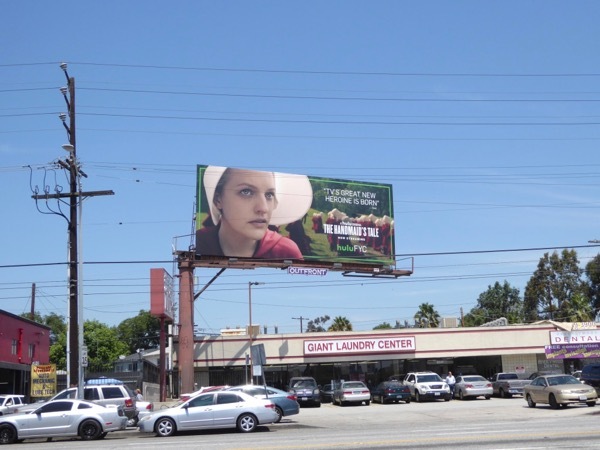 UPDATED: Here's also another Emmy consideration billboard for Elisabeth Moss and The Handmaid's Tale spied along La Cienega Boulevard on June 28, 2017. 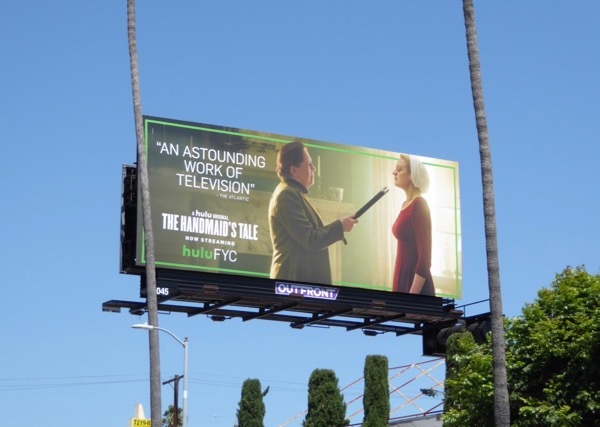 Plus this additional 'chilling and brilliant' Emmy billboard was spotted above Beverly Boulevard on July 8, 2017.